That is a great Santa. Where does he live? That is such a fantastic picture! 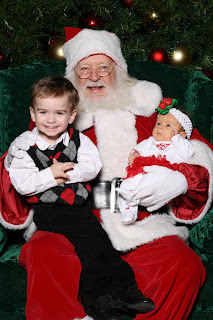 My girls wouldn't sit on his lap, but they did stand next to him, said cheese and smiled, so a HUGE difference from the scream fest of last year! I love Cannon with the ad - that is the too funny. It's timeless.